Pompey’s promotion hopes took another blow as they slipped to defeat at Barnet. It was former Blues striker John Akinde who grabbed the only goal of the game from the penalty spot late in the first half. The visitors improved after the interval and Adam McGurk went closest in their ultimately unsuccessful attempt to find an equaliser. Paul Cook made three changes from the side that drew with Yeovil at the weekend. Marc McNulty came in up front, with Michael Smith dropping to the bench, while there were also starts for Matt Clarke and McGurk in place of the suspended Christian Burgess and injured Gareth Evans. Pompey struggled to deal with Barnet’s physical style in the first half and lacked any real fluidity going forward. There were no real scoring chances in the opening stages and the only noteworthy moment was an early substitution. Gary Roberts hurt his hamstring in a challenge after just eight minutes and had to be replaced by Kal Naismith. The first opportunity fell to the hosts, with Ryan Fulton just about preventing a Sam Muggleton corner from creeping in at the near post. Akinde then raced onto a long ball forward, but – under pressure from Adam Webster – could only hit a tame effort straight at Fulton. But excitement was thin on the ground in a largely attritional and niggly encounter that failed to spark. Both sides realised that shots from long-range might be the best way to break the deadlock and swerving efforts from Naismith and Mark Randall were just about dealt with by the respective keepers. Instead, the opening goal came from the penalty mark and arrived after Ben Davies’ gained too many yards from a throw to see possession overturned. The ball was launched into the Blues box, where Webster was adjudged to have tripped Akinde. Referee Philip Gibbs pointed straight to the spot and it was Akinde stepped up to coolly slot the ball into the bottom corner. That seemed to jolt Pompey into life and Bondz N’Gala made a vital block to deny McNulty before Jamie Stephens gathered McGurk’s long-range strike at the second attempt. The visitors made a sloppy start to the second half, but Mathew Stevens was unable to capitalise on some poor defending. They almost drew level moments later, however, with McGurk rising above his marker to meet Davies’ cross and draw a fingertip save from Stephens. A deep free-kick from Naismith then somehow evaded everyone as it curled frustratingly out of play. Cook made his second switch on the hour mark – and it was an attacking one as Ben Close made way for Smith. But it was Naismith who should have levelled moments later, firing over the bar after being picked out by McNulty’s cut-back. Clarke was next to go close on 66 minutes when he met Naismith’s free-kick from the left and saw his header saved by Stephens. Pompey were looking much more of a threat now and it took a last-gasp clearance by Michael Nelson to get Davies’ low cross to safety. Cook made his final throw of the dice on 78 minutes, bringing on Conor Chaplin in place of McNulty. He was soon into the action after being bundled over by Tom Champion, only to see his free-kick punched clear by Stephens. The Blues kept pushing forward in the closing stages, but their large travelling support – who made up more than half of the total attendance – were not to be rewarded. Pompey returned to form in stunning style as they romped to victory over promotion rivals Bristol Rovers. They had already carved out a host of opportunities when Gareth Evans broke the deadlock midway through the first half. Michael Smith then opened his Blues account by converting a cross from the excellent Ben Davies just before the interval. And Marc McNulty came off the bench to add a third in the second half for the rampant hosts. The margin of victory could – and perhaps should – have been greater, but a combination of wasteful finishing and superb goalkeeping denied them even more goals. And a fine free-kick from Lee Brown late on for the visitors proved nothing more than a consolation. Paul Cook made three changes from the side beaten by Leyton Orient the previous week. Evans replaced McNulty, as Pompey reverted to a more familiar 4-2-3-1 system, with Smith leading the line. There were also a couple of switches in the defence, as Kieron Freeman and Matt Clarke made way for Davies and Adam Webster. The first half was an entertaining, end-to-end affair, although it was the hosts who carved out the better chances. Pirates keeper Steve Mildenhall made a stunning save in the opening seconds, somehow managing to claw away Christian Burgess’ header. That came from a Davies corner and the right-back delivered another cross moments later that was nervously dealt with by the visitors’ defence. The Blues certainly looked hungry and one flowing passing move involved Smith, Kyle Bennett and Gary Roberts, but the latter’s cut-back was intercepted. Mildenhall was then Rovers’ saviour once more, this time doing well to deny Bennett at his near post. But the keeper could do nothing to prevent Pompey from taking a deserved lead on 19 minutes. Smith played a superb cross-field pass to Davies and his ball into the box was deftly flicked home by EVANS. Rory Gaffney came close to levelling when he rattled the crossbar at the other end, although it would have been a controversial goal, as Roberts was lying injured on the turf. Rovers had certainly grown into the game and it took a fine challenge by Webster to halt Daniel Leadbitter’s dangerous run. It was still Pompey looking most dangerous, however, and Smith could not quite sneak a shot past Mildenhall after collecting Webster’s raking pass. Evans and Roberts should both have done better late in the half, with the duo failing to find the target from close range. But any feelings of frustration were lifted when the hosts did double their advantage in the third minute of stoppage-time. It was Davies who provided the assist once again, collecting the loose ball after his corner had been blocked and picking out SMITH to head home his first Blues goal. Evans had an early attempt once the second half got underway and Mildenhall had to tip the ball over the bar. He then tried a more acrobatic effort after connecting with Bennett’s cross, but this time it flew wide. The visitors were looking nervous and Tom Lockyer had to hack clear after Mildenhall and Tom Parkes made a mess of dealing with Davies’ low cross on 50 minutes. And Smith really should have added to his goalscoring account soon after, somehow sliding wide from a few yards out when Roberts’ pass found him unmarked in the box. The same duo then combined again, but this time Mildenhall came tearing off his line to deny Smith. Cook made his first change on 69 minutes and it was the tiring Smith who made way for McNulty up front. Adam McGurk then came on for the impressive Roberts as the game began to drift towards a conclusion. But it exploded back into life on 77 minutes when McNULTY latched onto Bennett’s threaded pass and slotted the ball into the bottom corner. It almost got worse for the ailing Pirates, only for Mildenhall to once again make a stunning save to deny Evans from point-blank range. McGurk almost got in act as well, but his curling effort was diverted over the bar by the head of Brown. Instead it was Rovers who grabbed a late consolation when Brown hammered home a ferocious free-kick from the edge of the box. But that failed to dampen the spirits of the Fratton faithful, who saw their side return to the top seven on a comfortable afternoon. While the progressive Pompey continue to drive forward, they have left behind the prolific 31-year-old. Today’s loan move to Eastleigh for the remainder of the season was long-anticipated. Stewart Donald’s club have realistic aspirations of reaching League Two. My mate Steve gave me his picture disk copy of Are ‘Friends’ Electric by Tubeway Army for my 50th birthday and followed that up by two more for my 52nd! 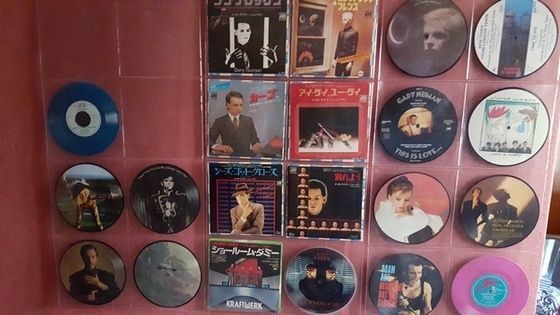 The wonderfully 80s sales gimmicks of picture disks are a thing of the past and gone with vinyl, which means there are a lot on eBay at cheap prices to add to the collection, and I also found a few of my own after digging deep in the attic. Three more spaces to fill! A stunning strike from Jobi McAnuff saw Pompey’s promotion charge stutter once more. Leyton Orient leapfrogged their opponents in the table after limiting the hosts to few clear-cut chances. Marc McNulty had the best of them before the break, but it was the Londoners who looked more likely to add to the scoring. Paul Cook made four changes from the side that drew at Morecambe during the week. Kieron Freeman was brought in for his debut at right-back, while Christian Burgess, Gary Roberts and Kyle Bennett all returned to the starting line-up. Adam Webster – who was carrying a slight hamstring strain – dropped to the bench, along with Ben Davies and Gareth Evans, while Kal Naismith missed out completely. Former Pompey loanee Alex Cisak started between the sticks for the visitors, but there was no place in their side for Nigel Atangana. The Blues came roaring out of the blocks and McNulty drew a save from Cisak in the opening few seconds. Then, at the other end of the pitch, Sammy Moore’s delivery from the right was deflected onto the roof of the net. Those incidents did not foreshadow a half of scintillating football, however, with the game soon turning into a drab affair. The crowd did their best to lift the mood at a blustery Fratton Park, but chances were thin on the ground. Pompey did spark into life around the half-hour mark when Cisak came charging off his line to deny McNulty following good work from Bennett. Freeman was then not quite able to pick out Roberts with a raking pass in a move that began with a lovely bit of trickery by Ben Close. Ryan Fulton had not been troubled in Pompey’s goal, but Orient did carve out a couple of chances before the break. McAnuff was the creator for both, with his crosses headed into the side netting by Mathieu Baudry and narrowly wide by Moore. Pompey had an opportunity just after the restart when the rampaging Freeman was felled wide on the right. He took the free-kick quickly and Roberts’ cut-back was intercepted, with Freeman hitting the loose ball wide. But Orient wasted an excellent chance to break the deadlock moments later – and it was their manager who was left hanging his head. Burgess made a great block to deny Jack Payne, but the ball sat up nicely for Kevin Nolan, who somehow managed to hit the bar from a few yards out. His blushes were spared on 53 minutes, however, thanks to a stunning strike from McAnuff. Jay Simpson’s path to goal was blocked and the ball sat up for the winger, who fired home an unstoppable first time shot from 25 yards. Cook made his first change on the hour mark, with home debutant Michael Smith making way for Evans and Pompey reverting to their usual 4-2-3-1 system. They soon had an opening when Bennett’s free-kick from the left made its way through a crowded box without anyone managing to get a touch. But it was Orient who almost doubled their lead on 66 minutes, with Simpson hooking over from close range after Fulton had kept out Nolan’s header. Simpson went close again moments later when he met McAnuff’s cross with a diving header that flew straight at Fulton. Pompey soon made a double change to try to inject some attacking impetus, with Conor Chaplin and Adam McGurk on for Bennett and McNulty. Referee Graham Salisbury booked Cisak for time-wasting as the visitors looked to see out the closing stages. Pompey were desperately trying to get the ball into the box and Chaplin’s header was deflected wide from Roberts’ corner. But it was Orient who almost scored near the end when Armand Gnanduillet met a cross at the far post and volleyed against the woodwork. And McGurk and Michael Doyle were both denied by brave Nicky Hunt blocks deep into stoppage-time as the visitors held on to secure all three points. Morecambe goalkeeper Barry Roche headed home a last-gasp leveller to cruelly deny Pompey victory at a gusty Globe Arena. The Blues were seconds away from brushing off their FA Cup disappointment by returning to winning ways in the league. Gareth Evans struck late in the first half and it looked like it would be enough to secure all three points in a game of few chances. But Roche came up for a corner in the final minute of stoppage-time to grab an unlikely equaliser. Paul Cook made four changes from the outfit that were narrowly beaten by Bournemouth at the weekend. Deadline day loan signing Michael Smith was thrown straight into a side that was set-up in a more traditional 4-4-2 formation. Winger Kal Naismith was a surprise inclusion, making his first Pompey appearance for almost three months. There were also starts for Adam Webster and Evans, as Christian Burgess, Gary Roberts, Kyle Bennett and Adam McGurk all dropped to the bench. The visitors made a bright start and Andy Parrish was well-placed to clear Marc McNulty’s low cross before it could reach a blue-shirted player. Evans then stole possession in a dangerous position, but could not quite thread a pass through to McNulty. Webster was grateful to Ryan Fulton at the other end on 13 minutes after his sliced clearance was claimed by the teenage keeper. But Pompey were soon back on the attack and Smith could not get enough power on his shot to trouble Roche after collecting Enda Stevens’ free-kick and turning sharply in the box. The Morecambe keeper then almost gave Morecambe the lead in farcical fashion when his goal-kick caught a strong gust of wind. A back-pedalling Fulton just about managed to grab the ball under his crossbar and had to palm it away to stop his momentum taking it over the line. The conditions were making life difficult for both sides, with the gusts and bobbly pitch not exactly conducive for the Blues’ usual passing game. But they almost forged ahead on 28 minutes when Webster met Naismith’s corner and saw his angled volley cleared from the line by Kevin Ellison. Debutant Smith then went close with a curling effort that was deflected narrowly past the post. The wind aside, Fulton was not being overly troubled and a long-range strike from Tom Barkhuizen flew straight into his arms. Pompey were looking more threatening, however, and the hardy bunch of travelling fans soon had something to celebrate. Their side might have taken the lead on 39 minutes, but McNulty blazed over after being sent through by Ben Close. They only had to wait a few more seconds for a goal, however, as Naismith did well to tee-up EVANS for a cool finish. Smith tried to add another before the break, but his fierce effort from distance fizzed narrowly past the post. Pompey continued to look the more dangerous side once the second half started and soon had a couple of openings. First McNulty burst into the box, only to see his low centre cut out by Parrish before it could reach a team-mate. And the wind was then playing its old tricks when Close’s corner landed on the crossbar and was bundled away by Roche. The Blues kept up the pressure and Naismith’s free-kick clipped the top of the wall after Andrew Fleming had been booked for handling just outside the box. Morecambe were not doing enough to threaten the visitors’ lead, but Luke Conlan finally found space down the left 70 minutes, only for his low cross to evade everyone on its way out of play. Cook made a double switch moments later, with Naismith and Smith making way for Bennett and Roberts. But the tide was starting to turn in the Shrimps’ favour and they were forcing their opponents into some sloppy passing. And the hosts were not too far away from an equaliser on 81 minutes when Jamie Devitt curled a shot onto the roof of the net. McGurk came on for McNulty for the closing stages as Cook decided to freshen up his forward line. Pompey looked to have hung on for the win when Fulton flung himself to the left and kept out Lee Molyneux’s strike in the fourth minute of stoppage-time. But there was still time for Roche to rush forward for the resulting corner and grab a point for Morecambe. The 24-year-old will wear the number 21 shirt during his time at Fratton Park and is available for selection at Morecambe on Tuesday. Smith joined the Robins in the summer of 2014 and has scored 26 goals in 72 appearances, while he spent time at Barnsley earlier in the current campaign. He previously featured for Darlington and Charlton, and netted against Pompey during a spell on loan at AFC Wimbledon in 2013.